Solid, liquid and gaseous; those are the three primary states of matter. The solid we experience in the objects we use, the liquid in the water we drink and the gas in the air we breathe. The total seven states of matter that science investigating are Solids, Liquids, Gases, Ionized Plasma, Quark-Gluon Plasma, Bose-Einstein Condensate and Fermionic Condensate. But we still have a problem with the fire, as it does not seem to fall into any of those classifications. And that is exactly why it has fascinated scientists for centuries. According to new research fire is a chemical reaction. It is something that happens to gases in most circumstances. And it is something that happens as a result of the heating of matter, solid, liquid or Gaseous, to produce vapors, which are then ignited when mixed with oxygen. So, it is not a solid or a liquid and it is almost a gas, but it is not completely gas. Fire is something that happens to gas. When you light a lamp, you are looking at a chemical reaction. And it is not a state of matter, its a reaction. Why fir is so hot? When we heat something, like wood in a fireplace, it releases gas. The reaction of these gases with oxygen in the air is what we see as fire. Combustion or the process of burning something is an exothermic reaction, which means that it is a chemical reaction that releases energy through light or heat. The chemical reaction called fire, releases a lot of energy and that is why the fire is so hot. Why can we see fire in the dark? When an electron jumps from one of these permitted states to another it emits a photon. That is light. The color of the light depends on the states between which the jump occurs and the atom in which the jump occurs. 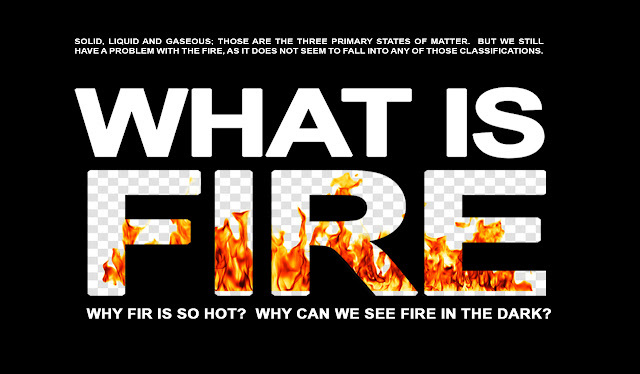 This explains not only what the fire is but also why it changes color depending on the material that we burn. Generally, the color of a flame may be red, orange, blue, yellow, or white. Electrons jump from atom to atom due to the heat that is generated around the flame, but we only see fire when the heat is such that the electrons have the strength to separate from the atoms and create ions.